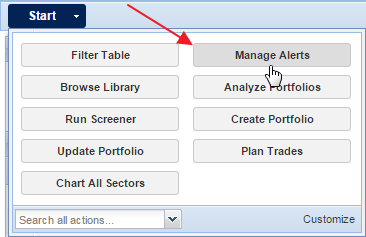 To modify an Alert, open the Alerts facility and click the pencil icon in the ‘Edit’ column. This will bring up a window where you can change both the trigger amount for that specific alert and the alert delivery method (email or text) by checking or unchecking the boxes. You can also right-click the Alert row and choose from the drop-down menu. Selecting ‘Edit Single Alert’ will open the same window just shown, but selecting ‘Edit All ___ Alerts’ will open up the full Create Alerts window, where you can edit any alerts that are in place for that ticker.